Downtown Boys are an American rock band formed in 2011 in Providence, RI. Downtown Boys formed after What Cheer? Brigade tubaist Joey La Neve DeFrancesco met vocalist Victoria Ruiz while working at the Renaissance Providence Hotel. DeFrancesco famously quit the hotel by handing in his letter of resignation accompanied by his What Cheer? bandmates. The footage of the resignation went viral. In 2014, the band released a 7" single on Washington D.C.-based Sister Polygon Records to wide acclaim. 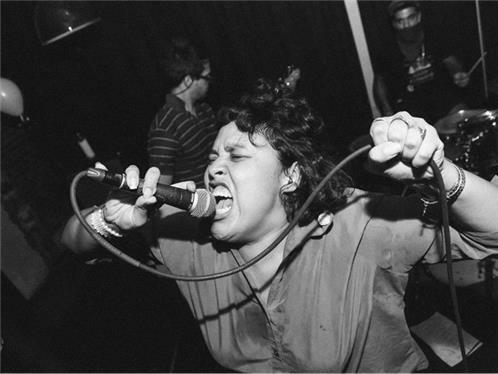 Downtown Boys released second LP, Full Communism, on Don Giovanni Records on May 5, 2015. The album's lead single, "Monstro", drew critical attention from Pitchfork, Stereogum, and the broader music press. Rachel Brodsky of Spin wrote of the single: "Bravely combating, as their press release reads, the prison-industrial complex, racism, queerphobia, capitalism, fascism, boredom, and all things people use to try to close our minds, eyes and hearts, Downtown Boys do what their finest punk-rock forefathers did before them: challenge long-held ideas."